Now a centerpiece of many direct-marketing programs, monthly giving provides a reliable, low-cost stream of revenue that sustains ongoing programs. It also increases the annual value (and loyalty!) of low-dollar donors. And now that it is possible to handle both sign-ups and payments online, one-time donors are becoming recurring donors at a faster pace, boosting retention rates and helping organizations cut down on billing costs. This is all great news for nonprofits. But what else do we know (or need to know) about online monthly giving? How should you manage your program? How can you measure success? What are your peers doing? We surveyed nearly 70 organizations and analyzed the online donor data of eight large nonprofits (see page 6 for a list of the participating groups) to get some answers. Some organizations send their first solicitation within 8 weeks of a new registration. Others focus their timing on the date of a donor’s first gift, and others run annual or quarterly recruitment campaigns. With an average monthly growth rate of 11%, the monthly donor programs we reviewed grew by 132% each year. The groups we surveyed retained 70% of their online monthly donors in their first year, but retention rate dropped to 52% the second year. The average online monthly gift (for all groups except international aid organizations) was $16. The average monthly gift for international aid organizations was significantly higher at $28. Promoting the Program. 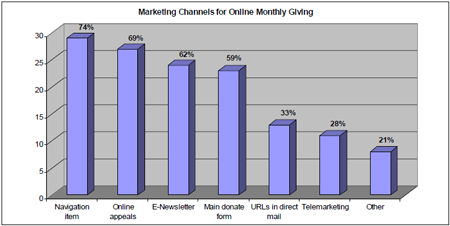 Navigation items promoting monthly giving on web page(s) were our survey respondents’ marketing method of choice, followed by email appeals and e-newsletter features. More than half the groups featured monthly giving on their main donation pages. See the chart below for a breakdown of the popularity of various marketing channels. Verdict Still Out On Timing. It’s tough to say who wins in the end, the tortoise or the hare, but there are plenty of each. Of the organizations that send online monthly giving appeals, 41% strike quickly, sending an appeal within 8 weeks of an online subscriber’s registration date – some as early as the day of the registrant’s confirmation email. Yet roughly 60% of the groups we surveyed operate on a schedule that is not based on registration date. Some organizations pay closer attention to the date of the donor’s first contribution; about 30% attempt to acquire monthly donors within six weeks of a one- time donor’s first gift. But when it comes to the frequency of online monthly giving appeals and campaigns, most organizations put on the brakes. More than half of our respondents conduct their monthly giving campaigns infrequently (30%) or not at all (21%). Quarterly (16%) and annual (16%) campaigns were the most popular, followed by monthly (14%) and weekly (2%). Handle With Kid Gloves. The prevailing opinion is that it is wise to treat online monthly donors a bit more gently than other donors. Fifty-three percent of our respondents send their monthly donors fewer solicitations (43%) or no solicitations at all (10%). In the other camp, 43% send them the same amount of solicitations as the rest of their donors, while 5% send them even more! Although almost a third of the groups surveyed either never send giving statements (24%) or send only a one-time acknowledgment (8%), the clear majority of our respondents send regular statements on an annual (32%) or monthly (also 32%) basis. Of those who send statements, barely one-third included cultivation copy and only 8% include an appeal for another gift. Since the survey results described above are mostly anecdotal in nature, we also reviewed the transactional data of eight large nonprofits in order to set more concrete benchmarks for online monthly giving. We did not have enough information to calculate the return on investment (ROI) on these organizations’ online monthly giving programs, but the growth and retention rates speak for themselves: If you build it, they will come (and stay for a while). Say Hello! The average annual growth rate for online monthly donors averaged 132%, or 11% each month. We saw occasional spikes in growth rates when an organization did more active recruitment. And Goodbye. The organizations in our study lost, on average, about 30% of their online monthly donors during their first year; still, that’s an annual retention rate of 70%. However, the retention rate dropped to 52% in donors’ second year. What Is a Monthly Donor Worth? With an average monthly gift of about $20, a monthly donor is worth about $240 per year, assuming no skipped months.3 Although this is an increase of roughly $1 over the past two years, after adjusting for inflation and taking into account sample size variability, this means the online monthly gift size has essentially remained the same – see below. The international aid groups in our study saw higher online monthly gift averages than other organizations (see chart below). Over the past half year, their monthly gifts averaged $28, while the other nonprofits saw an average of about $16. This is consistent with our findings in the eNonprofit Benchmarks Study thatonline donors to international aid organizations are more generous, with one-time gifts averaging $121 versus the nonprofit average of $97. Lifespans May Be Limited. The average lifespan4 of online monthly donors whose first gift was given about two years ago (between 10/2005 and 12/2005) was about 18 months. Because the data we analyzed started in September of 2005, we’re not sure what the “actual” lifespan is for monthly donors who gave their first gift more than two years ago. On average, we saw 12% of online monthly donors lapse at some point in their monthly giving cycle. Giving Goes Beyond Monthly. Online monthly donors don’t like to be pigeonholed as such. On average, 42% of online monthly donors gave a one-time online gift within the two years before becoming a monthly donor. And about 20% of online monthly donors gave a one-time online gift within a year after signing up to become a monthly donor. The average amount of this gift was $56, a nice boost to the existing monthly revenue from that donor. There’s still much to learn about online monthly giving, but to quote some of the most successful marketers of our time: Just Do It. While we’re still figuring out exactly how to do it, we have already figured out why to do it. There’s good money there, and you don’t want leave it on the table! If you have questions about our data or conclusions, or if you would like to discuss your organization’s monthly giving program or strategy, please don’t hesitate to get in touch with us. Online Survey We promoted our monthly giving survey in a variety of online forums, including the Nonprofit Technology Network (NTEN) blog and groups platform, the Progressive Exchange (PE) listserv and Care2’s frogloop newsletter. The survey resulted in 70 participants from a wide range of organizations, including arts, civil rights, education, health, international aid, youth, and environmental, among others. Their email lists ranged in size from under 50,000 (about half of respondents) to over 400,000 (14% of respondents). The questionnaire we used is available upon request. Monthly donors were tracked through their “lifespan” of monthly donations by a unique identifier. This unique identifier allowed us to look at the number of monthly donors in each organization and count the number of new and existing monthly donors each month. Through the unique identifier, we were also able isolate lapses in monthly giving by dividing the number of gifts given by the number of months between the first and last monthly gift. 1 This number is based on donors acquired about two years ago (between 10/2005 and 12/2005). 2 These numbers are based on donors acquired about two years ago (between 6/2006 and 9/2006). 3 This is calculated from the past 6-month average across study participants.